Adults broaching difficult situations or subjects with children can initiate hard conversations with books like these new publications. The uncertainties of today’s world can be overwhelming. Holly McGhee offers comfort in “Come with Me” (G.P. Putnam’s Sons, ages 5 and up). The unnamed girl worries because “the news told and told and retold of anger and hatred – people against people.” Her father takes her into a city where they “were brave and kind” and won “a tiny battle over fear for themselves and for the people of the world.” Gradually the girl gains confidence to go alone into the world and her parents muster courage to allow this. The author and illustrator, Pascal Lemaitre, present huge emotions and abstracts with simplicity that makes them approachable. Two new books help children understand the world more globally. Matt LaMothe’s “This Is How We Do It: One Day in the Lives of Seven Kids From Around the World” (Chronicle, 2017) has words and images that show the lives of children from Italy, Japan, Peru, Uganda, Russia, India and Iran – their homes, families, food, education and more. The afterward shows photos of the families who served as models for the author-illustrator. 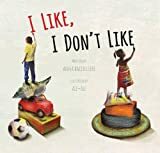 Anna Baccelliere’s “I Like, I Don’t Like” (Eerdmans, ages 6 and up) views global child labor and poverty. Seemingly simple illustrations give side-by-side collages and captions. The caption “I like shoes” shows a little girl playing with her mother’s high heels. On the opposing page is a young girl dwarfed by the oversized shoe she is polishing. It bears the caption “I don’t like shoes.” Both children of privilege and poverty are diverse in representation and the backmatter notes statistics and contacts for the Convention on the Rights of the Child and other organizations. Visual images drive Kate T. Parker’s “Strong is the New Pretty: A Celebration of Girls Being Themselves” (Workman, ages 6 and up). Parker, a professional photographer, was raised by parents who let her be herself, did the same for her girls, and now does this for readers of all ages. The collection of 200 stunning images and short poignant quotations are from diverse, dynamic young women ages 8 to 16. There is huge range in the moods, emotions, settings, advice and reflections. Nine-year-old Maya, in a strong karate pose, has “earned 14 state titles, 3 district titles and 6 world rankings.” Valeria, age 11, arms spread wide, writes “you can do anything,” her braces barely noticeable. Categories of confidence, wildness, resilience, creativity, determination and more trumpet the power and wisdom of young women. Adults uncomfortable discussing sexuality will find support in Karen Gravelle’s companion books: “What’s Going On Down There: A Boy’s Guide to Growing Up” and “The Period Book: A Girl’s Guide to Growing Up” (both from Bloomsbury, ages 9 and up). Gravelle’s organization makes these easy references. Her straight-forward, lively writing provides comfort and readability. Find calm with Mariam Gates’ “Meditate with Me: A Step-by-Step Mindfulness Journey” (Penguin, ages 4-6). Directions are easy to follow as cuddly animals model poses. Questions help children monitor their breathing, emotions and quiet.